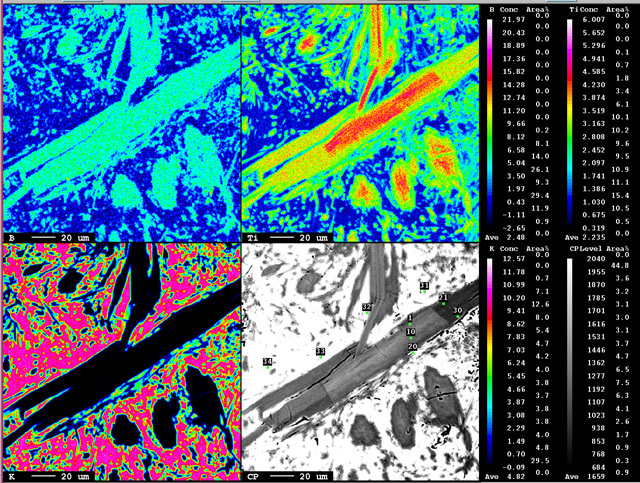 The new JXA-8200 electron probe at the GPS Division Analytical Facility is a state-of-the-art instrument for non-destructive full quantitative elemental analysis and SE, BSE, CL, X-ray digital imaging of solid materials. 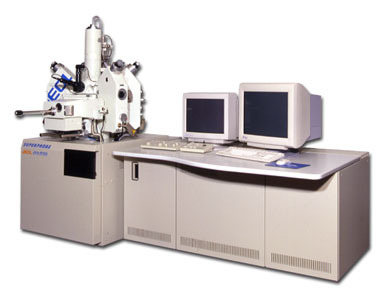 It is a fully-automated, customized probe with five wavelength dispersive X-ray spectrometers (WDS), one energy-dispersive X-ray spectrometer (EDS), tungsten and LaB6 electron sources, high precision sample stage (0.1 micrometer reproducibility), and two turbo-pumps and two dry pumps. The new probe has further improvement of basic probe performance and reliability (i.e., newly developed high-sensitivity X-ray analyzing crystals for better analysis precision, shorter counting time, and better light element analysis and mapping). The new probe being interfaced with the latest Probe for EPMA software provides full digital-control for more reliable and automated WDS microanalysis and digital imaging. Most of the periodic table can in principle be analyzed (Be through U). The analytical sensitivity ranges from a low of a few parts per million for optimum cases, to a typical detection limit of several hundred ppm. The volume sampled is typically a few cubic microns, corresponding to a weight of a few picograms. A precision approaching 0.X% relative and accuracy as good as 1-2% can be obtained. The new probe was installed in 2005 and became available for general use in mid 2006. The new probe was acquired in part by the NSF and NASA funds to replace the old JEOL 733 probe at Caltech.